Having just finished the VPI Avenger Reference turntable review I was aware that the company had several upgrades that supposedly would make appreciable sonic improvements to the Avenger’s already stunning performance. I found the Avenger so good, it is now my reference. Yet three weeks later I am trying to improve it. 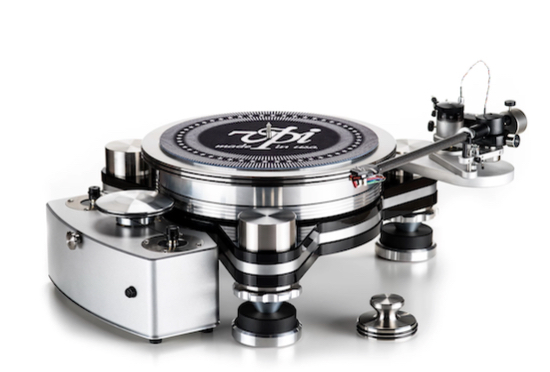 I requested a set of three footers (USD$1000—a set of four is USD$1350) from VPI. Mat Weisfeld, President of VPI soon had them at my door. I balked a little at the price and he suggested at least trying them and decide if they were worth it. I withheld my skepticism ‘till serious auditioning took place. I removed the standard footers and replaced them with the Reference Footers, a simple and intuitive thing to do, and started to play some records. One of the things I liked about the Footers was the large, knurled leveling rings. They made the process of leveling the table much easier. Full VPI Avenger Reference with Footers. There was a definite improvement in the sound. As a generalization, all the virtues of the Avenger were further elevated. Improvements in separation, clarity, soundstage development, greater image specificity, and three dimensionality, to name a few. At this exalted analog level, squeezing an additional percent of improvement in your system is usually very costly. Sure, the footers are not cheap, but I think they’re worth the investment and they’ll be staying in my system.